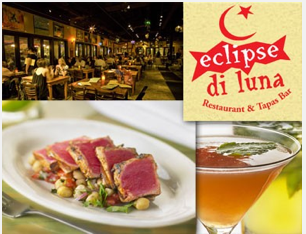 More Than Half Off Eclipse Di Luna $10 for $25! Eclipse Di Luna, I had been there years ago for my friends Ansley’s birthday party and really enjoyed myself. Good food, good wine and good music. They even had some dancing at some point. Or maybe I imagined that. Today’s Big Deal is muy bueno! $10 for $25 worth of food and drinks at Eclipse di Luna! Both fabulous locations – Buckhead and Dunwoody! If you’ve ever been to one of these great restaurants, you know paying 60% off your meal is a dream come true. If you’ve never dined at Eclipse di Luna… well, that are you waiting for? Once you walk through the door at Eclipse di Luna, you feel like you’ve stumbled upon the best-kept secret in the city. Their festive, high-energy interactive dining experience possesses an artsy setting as a backdrop with live music and award winning tapas. Go in and relax with them over a glass of wine, great food and live Latin entertainment. You will surely embrace the ambiance and fun at Eclipse di Luna.